You are cordially invited you to a FREE Screening on Friday, May 1st, of the critically acclaimed documentary Dark Side of the Full Moon. 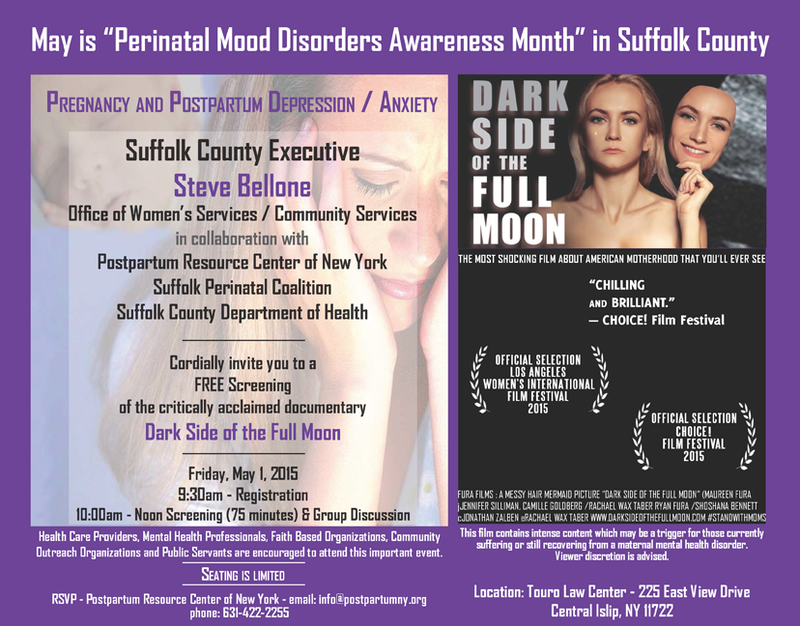 Hosted by Suffolk County Executive Steve Bellone, the Office of Women’s Services / Community Services, and in collaboration with Postpartum Resource Center of New York, Suffolk Perinatal Coalition, and Suffolk County Department of Health - this screening is the kick-off event for “Perinatal Mood Disorders Awareness Month” in Suffolk County. Health Care Providers, Mental Health Professionals, Faith Based Organizations, Community Outreach Organizations and Public Servants are encouraged to attend this important event. Seating is limited for this 75 minute screening, which will be followed by a group discussion.